Swim with dolphins, snorkel over coral reefs, visit Ernest Hemingway’s home or just relax on a beach and enjoy the balmy climate of this beautiful group of islands. 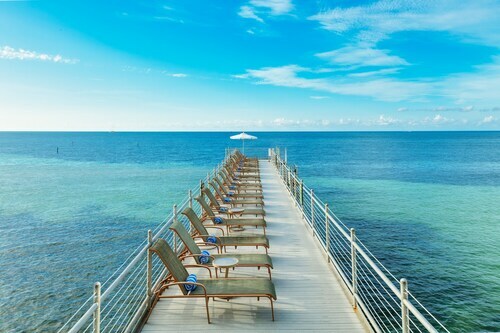 The Florida Keys is an archipelago that sits just off the south coast of mainland Florida. The islands are only 15 miles (24 kilometers) south of Miami. The region is a hot spot for vacationers due to its tropical climate, sandy beaches and coral reef. Popular activities include diving, snorkeling and sunbathing. You can fly to the Key West International Airport on regularly scheduled commercial flights. Charter and private aircraft are serviced at the Florida Keys Marathon International Airport in the city of Marathon, which sits in the centre of the archipeligo, as well as the Summerland Key Airfield further south. Alternatively, take the Overseas Highway to the island of Key Largo, a journey of one hour's drive from Miami. At Key Largo, you can marvel at the colorful fish and underwater wonders at John Pennekamp Coral Reef State Park and check out the Florida Keys National Marine Sanctuary and the Botanical State Park. Spend the afternoon in the region of Islamorada, which comprises several islands. Try your hand at fishing. Swim with dolphins at the Theater of the Sea. Then, meander along hiking paths or learn about the islands’ history at Indian Key Historic State Park. Keep moving south to the town of Marathon. Attend seafood festivals in the family-orientated region. Relax on Sombrero Beach. Follow some of the trails through the 64 acres (26 hectares) of Crane Point. The Seven Mile Bridge connects Marathon to the southern islands of the Florida Keys. Take part in the annual fun run across the bridge in April. On the other side of the bridge, explore Big Pine Key’s The Blue Hole, an old limestone quarry filled with fresh water where all types of wildlife congregate. It is part of the National Key Deer Refuge. Backcountry kayak and paddle boarding trips are a famous pastime here. Complete your tour of the archipelago at Key West, the southernmost point of the Florida Keys. Learn about the history and culture of the area through attractions such as the Ernest Hemingway Home and Museum where the famous author wrote some of his famous works. Separated from the mainland and encased by golden beaches and colorful coral reefs, this is a national park of fascinating ocean scenery. The southernmost beach in the continental United States is a convenient sandy enclave, just minutes from the center of town. Discover Key West’s most notable historic figures as you follow a walking trail through this enormous cemetery, home to more than 100,000 graves. Arrive at this square at day’s end to find street performers, food carts and one of the most beautiful sunsets in the United States. Come face to face with huge sharks, feed stingrays and learn about local tropical fish at this great aquarium. 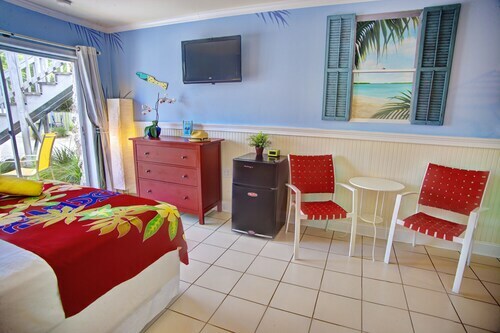 Situated near the airport, this hotel is within 3 mi (5 km) of Key West Golf Club, South Beach, and Smathers Beach. Duval Street and Higgs Beach are also within 3 mi (5 km). 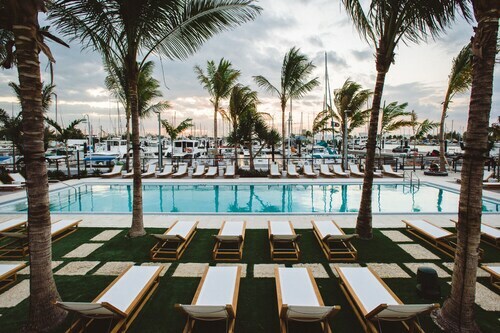 Situated in Key West, this golf hotel is 0.2 mi (0.4 km) from Key West Harbour and 2.1 mi (3.4 km) from Key West Golf Club. Robbie's is 1.8 mi (2.9 km) away. 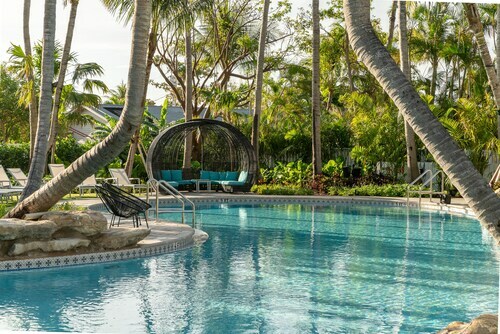 Situated near the airport, this hotel is 2.2 mi (3.6 km) from Key West Harbour and within 6 mi (10 km) of Key West Butterfly and Nature Conservatory and Key West Lighthouse and Keeper's Quarters Museum. Southernmost Point and Mallory Square are also within 6 mi (10 km). 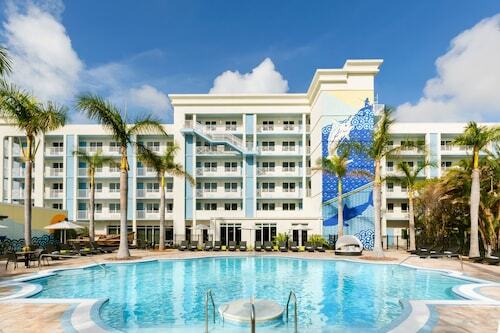 The white-sand beach of Ibis Bay Beach Resort is a 5-minute drive from downtown Key West. Both the Ernest Hemingway Home & Museum and Southernmost Point are 17 minutes away by bike, and Sunset Pier on Duval Street is a 10-minute cab ride. Key West International Airport is 2.8 miles (4.5 km) away. 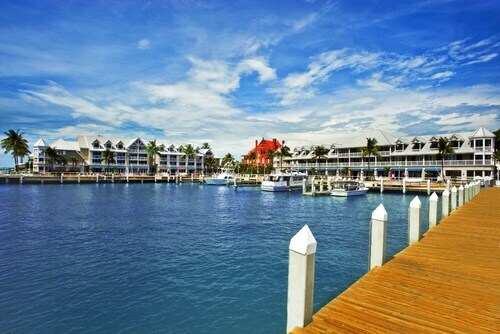 Situated on the waterfront, this resort is 1.3 mi (2.2 km) from Key West Harbour and 1.8 mi (2.8 km) from Key West Golf Club. Smathers Beach and Key West Butterfly and Nature Conservatory are also within 6 mi (10 km). This Key West historical district hotel is 2 blocks from Southernmost Point. Ernest Hemingway Home and Museum, and Key West Lighthouse and Keeper's Quarters Museum are both a half-mile away. Situated in Key West, this hotel is steps from Custom House Museum, Duval Street, and Mallory Square. Key West Aquarium and Harry S. Truman Little White House are also within 5 minutes.